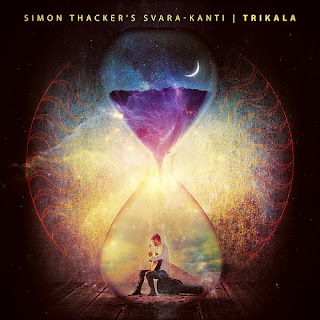 The classical guitarist Simon Thacker continues his cross-culturation explorations with his ensemble Simon Thacker's Svara-Kanti with this new double-album Trikala on Slap the Moon records. For this disc he has brought together a total of 13 musicians from a variety of traditions, both Western Classical and Indian, including different traditions from the Indian sub-continent. They come together as a series of different ensembles and explore a wide spectrum of the musics from the sub-continent. The music on the disc encompasses Hindustani classical (north), Carnatic classical (south), Punjabi folk (west) and the Bengali mystical folk Baul tradition of both India and Bangladesh (east), and there is also a work with a Tamil inspiration, and one of Bengali polymath Rabindranath Tagore’s best loved melodies. With all the music on the disc re-imagined by Simon Thacker. This is a huge project, there are two CD's (138 minutes of music) with recordings made in East Lothian, and Chennai and Kolkata in India over what looks like a period of three years. And the music follows this wide variety, with not just different traditions, but different line-ups of artists and different combinations of instrumental and vocal textures. If Thacker's intentions weren't so serious and his sympathy with the music so striking, it could all very much feel like a child playing in a toy-box. 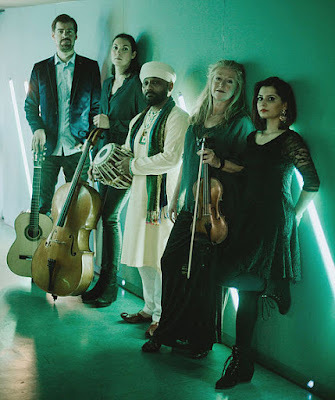 But it doesn't and listening with ears barely attunded to the nuances of the various Indian classical musics, there is a continuity to the pieces which represents Thacker's own contributions to the mix. The disc comes with a substantial booklet with explains the various tracks, where the music comes from and how Simon Thacker has worked with it. This is very much a disc for those with questing minds, for the curious and for those willing to experiment. Available from Simon Thacker's website.